Bengaluru: Infosys Ltd and Wipro Ltd have invested over $65 million in 11 start-ups so far, but the money and a springboard to take their new-age technologies to the world’s largest corporations have not been compelling enough reasons for the smaller partners to bind themselves into exclusive tie-ups with two of India’s information technology leaders. 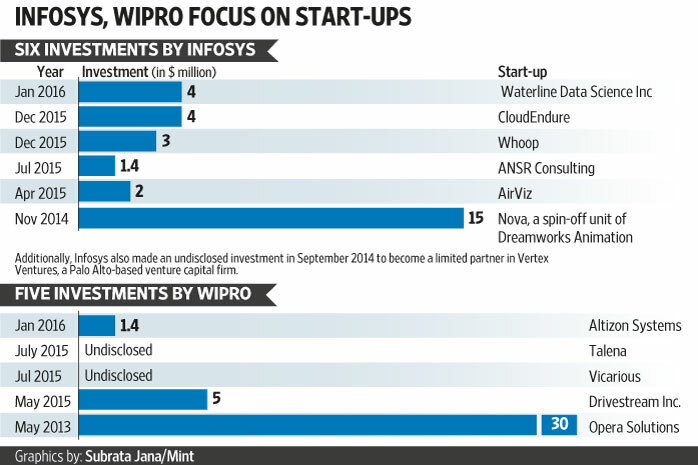 Infosys and Wipro maintain their backing to start-ups, which are based out of the US, Israel and India, should not curtail the latter from partnering other outsourcing firms, some of which are even their rivals. However, experts said this reflects how the balance of power is shifting towards start-ups, some of which pose the biggest existential threat to the poster boys of the country’s $146 billion technology sector. Until now, many executives at both Infosys and Wipro believed that their investments would limit these start-ups from offering their technology to other outsourcing firms, including Tata Consultancy Services Ltd (TCS) and Accenture Plc. Infosys’s chief executive Vishal Sikka, and Rishad Premji, who is overseeing rival Wipro’s $100 million venture arm, are looking to redefine the way corporate venture arms work as they look to maximize what they call start-up engagements with clients. However, Wipro’s Rs.9.78 crore investment to pick a 20% stake in Altizon Systems Pvt. Ltd, a Pune-based start-up which helps organizations analyse data sets gathered by connecting devices, put a spotlight on exclusivity. Persistent Systems Ltd, another Pune-based small IT firm, picked a 4% stake in Altizon in 2014. 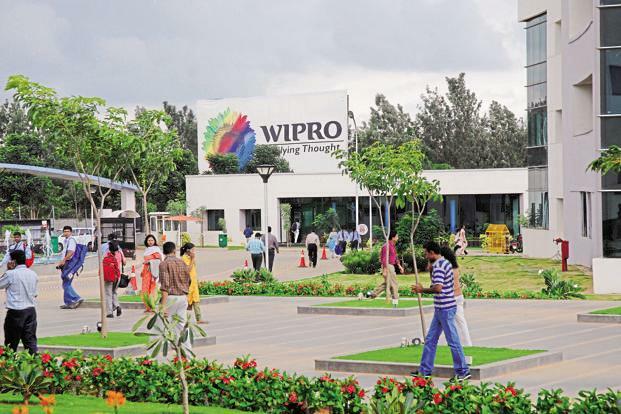 “Wipro Ltd does not see partnerships with investee companies as exclusive arrangements. An investment by Wipro Ventures does not preclude these companies, including Altizon, from working with other SI (system integrators)/consulting partners,” said a spokesperson for Wipro. Infosys’s investment of $4 million for a maximum stake of 20% in Waterline Data Science Inc., a data analytics start-up based in Delaware, US, is also interesting. Aashish Chandra, global head of technology of retail and consumer packaged goods sector at TCS, is on the board of advisers at Waterline Data Science. “There is no formal commercial relationship between TCS and Waterline Data. Aashish Chandra had joined our advisory board before his appointment at Tata. He is an expert in big data and a valuable adviser, and we welcome his continuing participation on the advisory board,” said Alex Gorelik, founder and chief executive of Waterline Data Science. “We believe in an open ecosystem and do not restrict our portfolio firms to only work with us, nor do we as Infosys constrain ourselves to only work with start-ups that we have directly invested in,” said a spokesperson for Infosys. Waterline has not worked with TCS until now, but Infosys said the start-up is free to work with any company. Yet, a Waterline executive said Infosys will be the “preferred partner” for some engagements. “As part of the investment, Infosys and Waterline have a partnership agreement in which Infosys will be the preferred partner for certain kinds of engagements,” said Venky Ganesan, managing director at Menlo Ventures, and a founding investor and board member at Waterline. Why do the larger companies pick stakes in start-ups when it does not come with exclusivity? “We have tried this (partnership arrangement) in the past but this does not work. You need to have skin in the game. You need to put in money. Also remember, most of these startups are focused on disruptive technologies. We are not sure which of these will eventually succeed. So you place multiple bets. It’s like backing five horses in a race—you place bets on all five horses, and whosoever you believe is doing well, you eventually raise your stake, even if you do it at a premium at a later stage,” said an Infosys executive, on condition of anonymity. Nonetheless, Sharad Sharma, co-founder of software products think-tank iSPIRT, said that this reflects how start-ups are playing the game on their terms. “The balance of power is clearly shifting towards the start-ups and Indian IT firms recognize this, and so there is no clause of exclusivity per se when they invest,” said Sharma. “Corporates’ venture arm deals vary in terms of restrictions, but I’m seeing that the trends are toward more open and permissive terms with respect to working with competitor firms,” said Robert Wolcott, professor of innovation at Northwestern University’s Kellogg School of Management. “The world is moving over to an open, collaborative ecosystem. So, if one of our portfolio companies gets business from our rivals, it’s good for us also,” said the Infosys executive cited above.